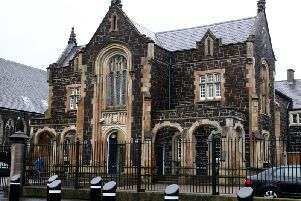 The final meeting of Larne Borough Council took place in Smiley Buildings on Monday evening (March 23). With Mid and East Antrim Borough Council preparing to take over the reins on April 1, the outgoing authority met one last time to tie up any remaining business. At the meeting, chief executive Geraldine McGahey read out an email from CEO of the new super council, Anne Donaghy, thanking all elected members for their “hard work during the shadow period”. Mrs Donaghy also issued an open invitation to those members who will not be on the new council, urging them to contact her with any issues they may have. “I wish you all every succes sin the future,” she concluded. Councillor John Mathews proposed, and it was resolved, that Larne Council should respond accordingly. An AGM of MEA Council was to take place on Tuesday.